You could say that I've been on a bit of a cloisonne kick lately. 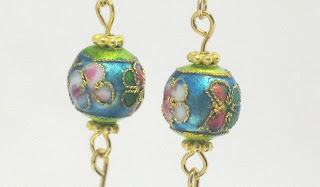 I've always loved these colorful enamel beads but my love went into high gear on a recent trip to NYC. I spent almost 4 years living in Manhattan and truly miss it. Don't get me wrong, I adore my life here in Boston with my husband and I've gotten spoiled by all the space and actually having a yard! But there is something about the energy in NYC. Some of my closest friends still live there (including a beading buddy) so I get lots of excuses to visit. On one of my recent trips, my partner in bead-spending and I went shopping in the Bead District. My favorite stop was Beads World USA - I could have spent hours and lots of money there but I managed to restrain myself (a little). Anyway, my friend and I found a huge section of cloisonne beads for sale and we had a blast browsing. I finally narrowed down my selections and picked some beauties. When I got back to Boston I had a blast turning them into earrings. I wound up making 7 pairs and most are accented with Swarovski crystals (another favorite type of bead). They're all listed in this section of our store but I've added some photos of one pair for instant gratification. 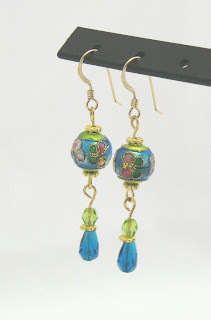 I love the color combinations in this pair and the cloisonne design has a lovely floral and butterfly pattern that instantly drew me in.